Wood stove installation in your home needs to be done in a completely fireproofed area. Make sure your home is safe before your new wood stove is put to use. The warmth from a fire and the image that it conjures is a powerful one. The fireplace and hearth is often the focal point of a room or home. While fireplace inserts are helping to make fireplaces more efficient, a wood stove can often offer the best of both worlds. Installing a wood stove can help reduce your heating bills in the winter, heating up to a 2,000 square foot home efficiently. Wood stoves can also be installed in rooms without working fireplaces, provided a chimney or exit for the piping can be provided. This means that wood stoves can be installed in lower level family rooms, bedrooms, kitchens and other areas where a little extra warmth would be appreciated and valued. A fireplace is a completely fireproofed box built right into your wall. If you take a look at it, you'll find bricks, tile, a hearth and fireproofed materials extending inside and out. You'll need to create a space like this for your wood stove as well. This means making sure that the area beneath, behind and in some cases above your wood stove are burn proof and capable of handling high heat. If you have wood flooring or carpeting in the room where you wish to install a wood stove, you have a couple of choices. You can build a fireproofed hearth, or shelf for your wood stove to sit on or you can fireproof you floor. If you choose to build a hearth, you can construct it out of brick, stone or tile. 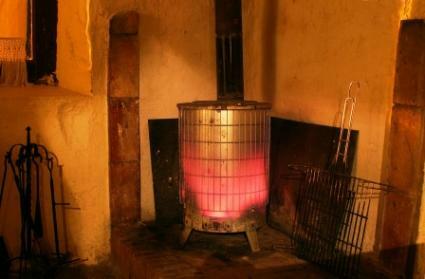 It must extend outward from your wood stove by a minimum of 8-inches on each side, and 18-inches in front of the doors. Some states and towns may require more clearance then this; check with your local fire department before beginning. You can also choose to tile your entire floor. All tile including ceramic, porcelain and stone is fireproof, and can be used beneath a wood stove. This is an attractive option for homes with low ceilings where raising the wood stove on a hearth could be a problem. Check out a limestone or slate floor for a rustic look, or a ceramic wood tile floor for something more contemporary. Your stove will need to be installed a safe distance from any combustible material on the walls. Depending on the model, this can be anywhere from 8 to 36-inches. Depending on the size of your room, you may not wish to bring it in quite so far. If this is the case, you will need to cover the wall behind your wood stove with a fireproof material. You can choose from exposed brick, fieldstone or any type of tile or stone for a finished appearance that will complement the rest of the room. Whether or not you decide to fireproof your ceiling will depend on a few factors such as the model and size of your stove, and the height of your ceiling. You may need to look into a fireproof ceiling material, such as Celotex before you install your stove. You will need to have a chimney to install a wood stove. This can be a masonry chimney, of the same kind your fireplace taps into, or it can be made of metal. The stovepipe itself cannot simply exit through a door, window or wall; it must be properly insulated. The type of chimney you have installed will depend on the wood stove, its placement in your home and the type of home that you have. You can run a metal chimney out of a wall and straight up the side of your house, boxing it in from the outside, but the stovepipe itself must go into a chimney within 2-feet of the stove itself. Once you've taken the proper steps to set up for your wood stove installation, the installation itself is the easiest part. The stove will be mounted to the ground or hearth at the correct distances from combustible materials. The stovepipe will then be inserted into the chimney and clamped in place. Once installed, your wood stove can begin to warm your home with an efficiency that may surprise you, while creating a warm glow to light any room.